The former Nevada lawmaker who says former Vice President Joe Biden inappropriately touched and kissed in 2014 told ABC News she remembers the encounter as "awkward and disturbing." 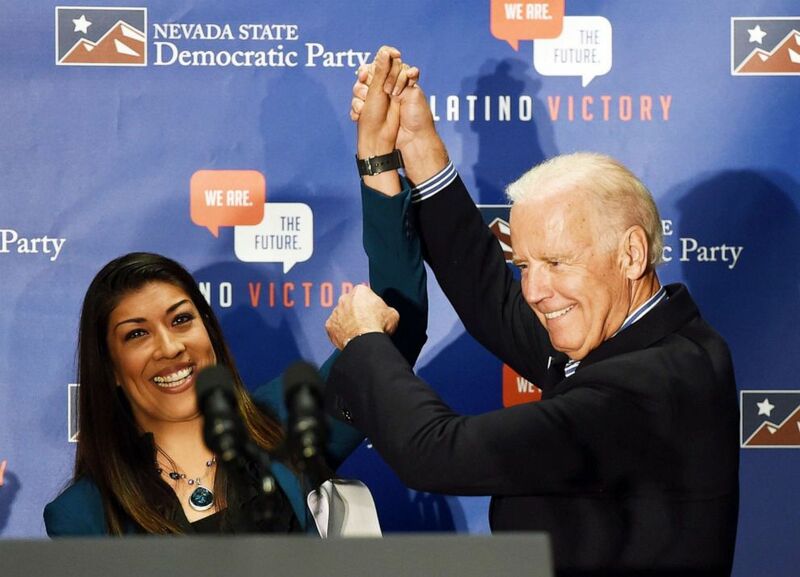 Lucy Flores, a social justice advocate who served as a Nevada assemblywoman, said in an interview on "Good Morning America" that when Biden campaigned for her when she was running for lieutenant governor, he allegedly leaned in behind her, smelled her hair and gave her a slow kiss on the back of the head. "I didn't even know what to do," she said in the interview. "I didn't know how to react. "It was the vice president of the United States of America," she continued. "You just don't expect that to happen." Flores initially came forward with the allegations Friday in an article for New York magazine's The Cut, titled, "An Awkward Kiss Changed How I Saw Joe Biden". 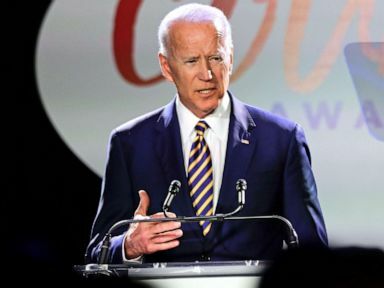 Biden issued a statement Sunday in which he said it "was never my intention" to make Flores or another woman feel uncomfortable. “In my many years on the campaign trail and in public life, I have offered countless handshakes, hugs, expressions of affection, support and comfort. And not once -- never -- did I believe I acted inappropriately," he said in the statement. "If it is suggested I did so, I will listen respectfully. But it was never my intention." He added that he did not recall the alleged interaction with Flores, but said "we have arrived at an important tiem when women feel they can and should relate their experiences." "And men should pay attention," he said. "And I will." Biden said he would continue to be the "strongest advocate" he can be for women. Democratic candidate for lieutenant governor and current Nevada Assemblywoman Lucy Flores introduces U.S. Vice President Joe Biden at a get-out-the-vote rally in Las Vegas, Nov. 1, 2014 . Flores was the 35-year-old Democratic nominee for lieutenant governor in Nevada when the alleged incident occurred at a campaign event on Nov. 1, 2014. "As I was taking deep breaths and preparing myself to make my case to the crowd, I felt two hands on my shoulders. I froze. 'Why is the vice-president of the United States touching me? '” Flores wrote. "I felt him get closer to me from behind. He leaned further in and inhaled my hair. I was mortified. I thought to myself, 'I didn’t wash my hair today and the vice-president of the United States is smelling it. And also, what in the actual f---? Why is the vice-president of the United States smelling my hair? '” Flores' account continued. "He proceeded to plant a big slow kiss on the back of my head. My brain couldn’t process what was happening. I was embarrassed. I was shocked. I was confused," she wrote. "I wanted nothing more than to get Biden away from me. My name was called and I was never happier to get on stage in front of an audience." Flores wrote that she had considered Biden to be attending the event in a professional capacity. 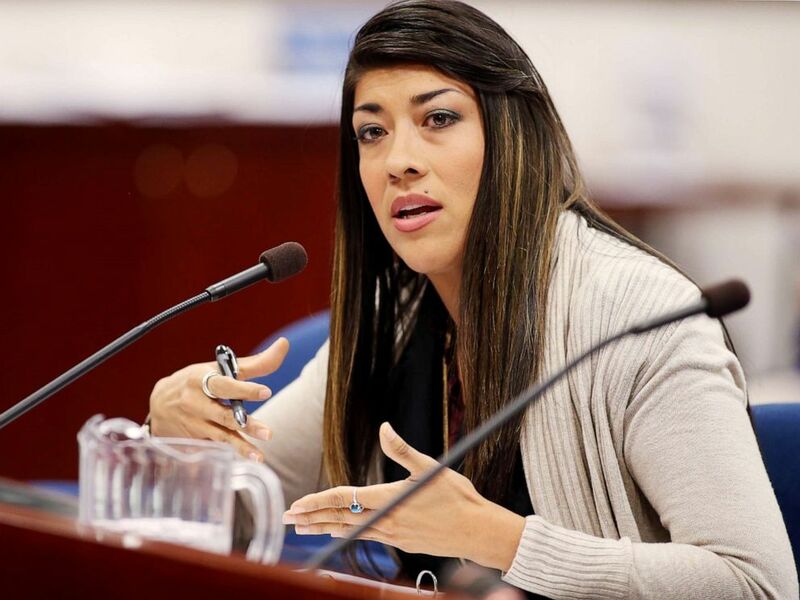 Nevada Assemblywoman Lucy Flores presents a measure in committee at the Legislative Building in Carson City, Nev., May 10, 2013. "Biden came to Nevada to speak to my leadership and my potential to be second-in-command — an important role he knew firsthand. But he stopped treating me like a peer the moment he touched me. Even if his behavior wasn’t violent or sexual, it was demeaning and disrespectful. I wasn’t attending the rally as his mentee or even his friend; I was there as the most qualified person for the job." In the interview, Flores called the exchange "awkward and disturbing and weird." Although Biden has not definitively indicated whether he will run, his past actions are being scrutinized as that of a would-be candidate. Earlier this week, he drew ire from women's groups after he referenced his oft-criticized treatment of Anita Hill during Clarence Thomas' Supreme Court hearings in 1991. During the hearings, Hill was dismissed in her testimony about Thomas's alleged sexual harassment by members of the Senate. At the time, Biden was the chairman of the Senate Judiciary Committee. Biden has apologized frequently in public remarks to Hill, whose testimony has been seen in a new light since the #MeToo movement has grown. On Tuesday, Biden renewed the conversation about his treatment of Hill when he spoke at the “Biden Courage Awards” to honor those who have worked to combat sexual assault on college campuses. Former Vice President Joe Biden speaks at the Biden Courage Awards in New York, March 26, 2019. "To this day, I regret I couldn’t come up with a way to get her the kind of hearing she deserved given the courage she showed by reaching out to us,” Biden said at the event, which took place in New York. In an interview with Elle magazine last September, Hill said, "There are more important things to me now than hearing an apology from Joe Biden. I’m okay with where I am." The former vice president's remarks have renewed calls for an in-person apology to Hill. In January 2018 he was asked on PBS if he would apologize in person and he said that he hadn’t planned on it.